270702 Features: -Operates solely on 3.3V adapter (included). -Black faux leather exterior and glass front cover. 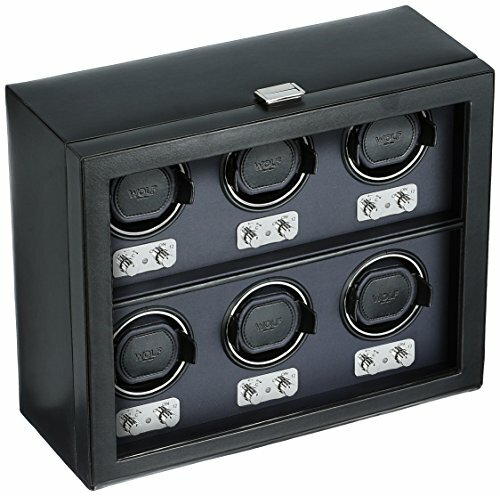 -Chrome clasp closures and control knobs. -Rotation settings: Pre-programmed at 900 turns per day. -Directional options: Clockwise, Counter-Clockwise or Bi-Directional. -Start delay options: 10 Seconds or 12 hours. Product Type: -Watch box. Shape: -Rectangle. Style: -Contemporary. Finish: -Black. Interior Material: -Fabric. Exterior Material: -Faux leather. Dimensions: Overall Height - Top to Bottom: -13". Overall Width - Side to Side: -15.5". Overall Depth - Front to Back: -6.5". Overall Product Weight: -30 lbs.